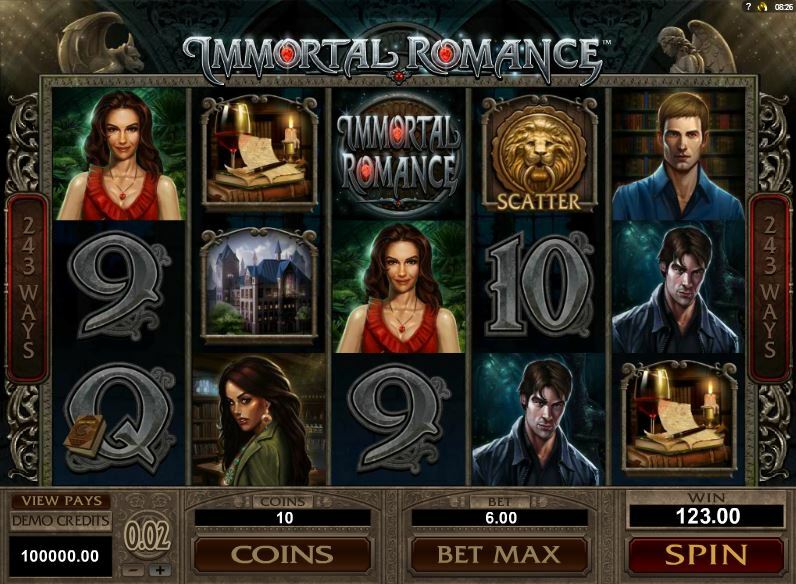 If you have an interest in vampire romance movies or novels, Immortal Romance will be right up your alley, a very well thought out and designed slot machine from Microgaming, which deals exactly with this kind of topic. The names of the four characters that are involved in this romance themed game are Michael, Sarah, Troy and Amber. The game’s design and high quality features will insure that you’re going to enjoy yourself if you give it a try, but you can read more about them below. The game’s 5 reels can host up to 243 ways to win, or chances to form a combination each round. 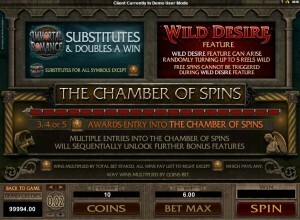 Microgaming used wild symbols, wild reels and a feature called The Chamber of Spins, which combines free spins with some impressive wild abilities. The prizes go only up to $1,200. 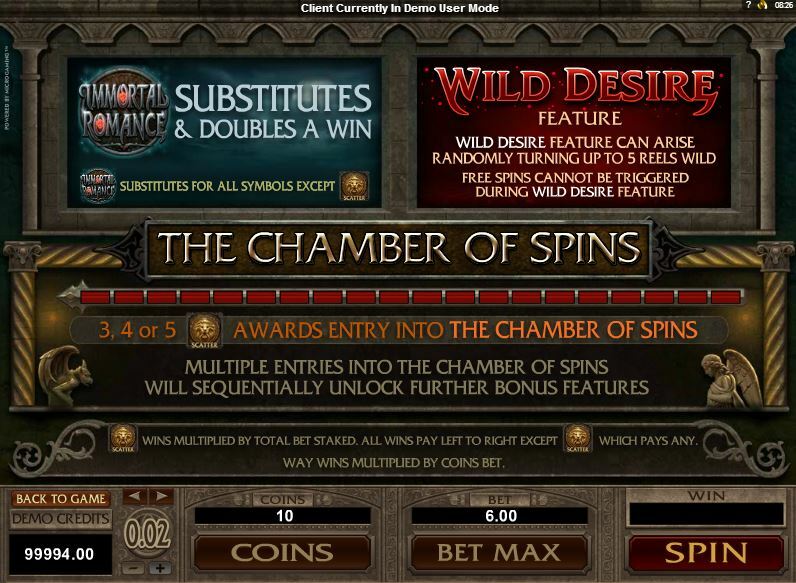 The game has a lot to offer in this area, starting with its ways to win, with the wild symbol that has a multiplier, with the Wild Desire feature, and with Chamber of Spins, the one that has the most variety in it. As a game that uses ways to win, Immortal Romance will ask only that the symbols which form combinations be on adjacent reels, and going from left to right. They no longer have to be only on a limited number of predetermined paylines, they can be in any position on the reels. That’s how they managed to offer 243 ways to win/paylines. The Immortal Romance Logo is your typical modern slot machine wild symbol. It will give away its own prizes, and you can also count on it being a substitute for other symbols, plus it will multiply the wins by 2x, doubling their value. The only symbol that doesn’t get help from the wild is the scatter. This is a random feature, one that isn’t triggered by the appearance of certain symbols, so you never know when it will start up. Up to 5 reels are turned wild by the start of Wild Desire, so it’s definitely a feature you want to get. You can’t trigger free spins when this feature is running, but that’s its only downside. 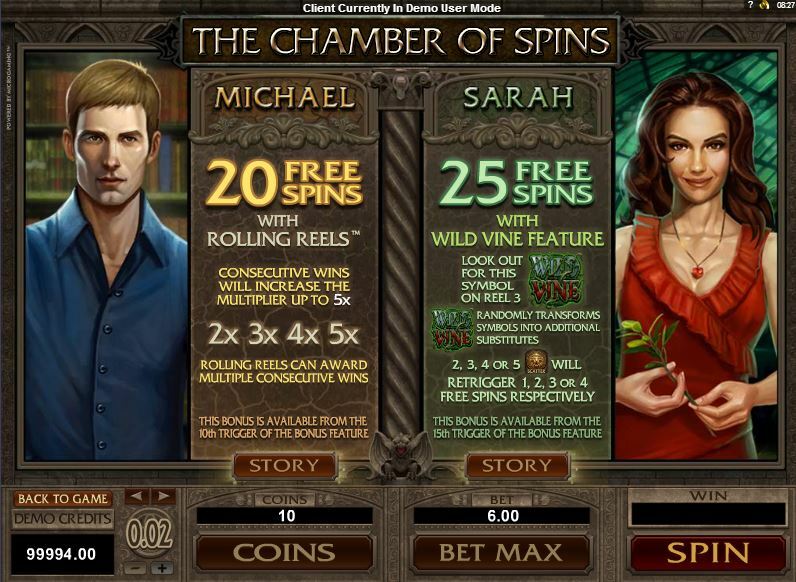 The game’s free spins are offered as part of an elaborate feature called The Chamber of Spins. You trigger it with assistance from the scattered Door Knocker, which takes the form of a golden lion head. This symbol is going to reward you with handsome prizes, of up to 200x the bet, when you have multiple symbols of this type on the reels. You need only two of them to start getting paid, and the most you win when all five are present. Triggering the Chamber of Spins is done with help from 3 to 5 Door Knockers. 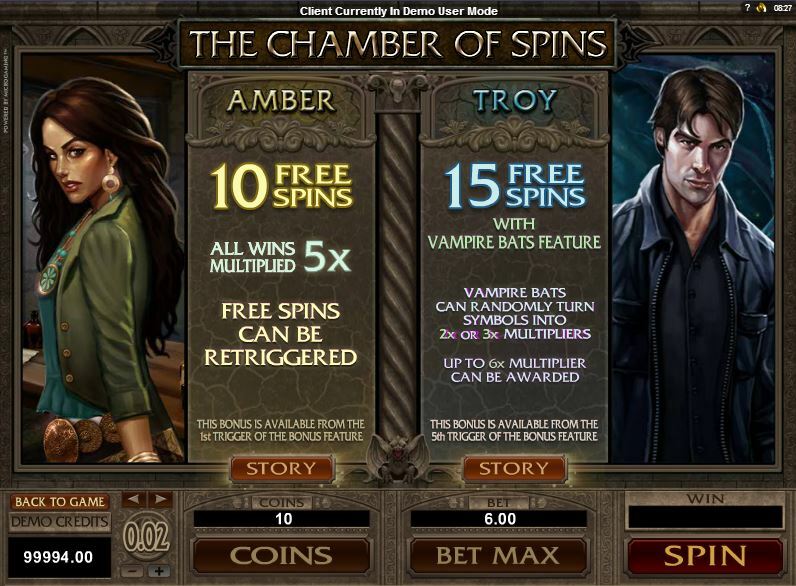 You initially get access to the first feature, called Amber, but once you get access to the bonus game a number of times, you start getting the other types of free spins as well. Amber is the name of the feature that you get initially. You are awarded 10 spins for free by it, with multipliers for the wins being at 5x, which is quite generous. You can also retrigger the free spins. Troy is the second feature, which you can trigger once you’ve had the bonus game started at least five times in the past. In its case, you get 15 spins for free, plus you have vampire bats that will turn random symbols into multipliers of 2x or 3x. The most you can get from it is a 6x multiplier. 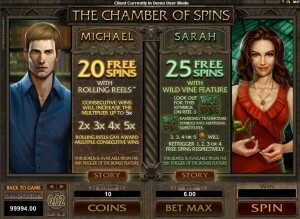 Michael is the third type of free spins feature, available starting with the 10th bonus feature trigger. 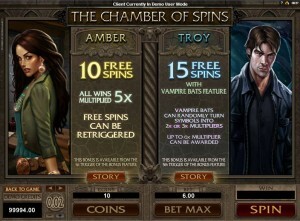 You get 20 free spins in this case, plus the Rolling Reels feature with multipliers. Each consecutive win that comes as a result of Rolling Reels will give you a higher multiplier, going from 2x to 5x. Sarah is the fourth type of bonus feature that you can get from Chamber of Secrets. You need to trigger the bonus game at least 15 times, before you can select Sarah from the list. She will bring you 25 spins for free, with a Wild Vine feature. Whenever the Wild Vine symbol appears on the 3rd reel, it will turn other symbols into wilds, picking them at random. You can also retrigger 1 to 4 free spins, with 2 to 5 scatters. You can spin the reels of this game with as little as $0.30, or with a bet of up to $6. It’s quite cheap to play, as you can see, but the downside is that it doesn’t pay too well either. The 30 lines that are used for wagering purposes will accept bets of up to $0.20, using up to 10 coins of $0.02 to get to that figure. 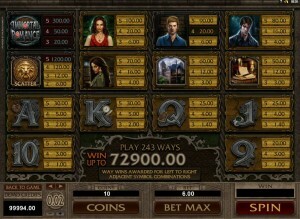 You can win up to 6,000x the line bet, which is a decent amount, and in this case it can mean 60,000 coins. The cash value is only $1,200 though, as the denomination is at $0.02 or lower. 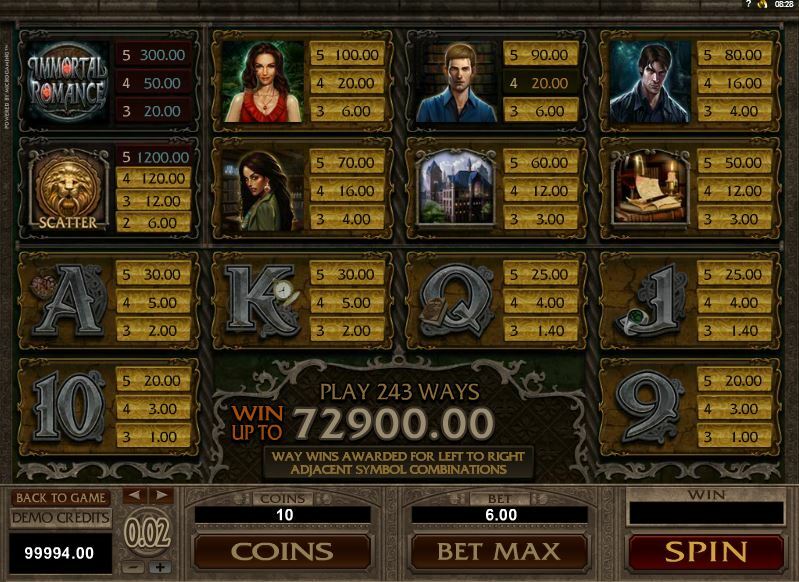 Though the features are very elaborate and can be a great reason to play this slot on their own, the truly impressive part about it would be the design used in the game. It has the dark atmosphere and the scary statues that you would expect to see, plus there are the four characters that look great, and various images that will support the story one way or another. I’ve enjoyed looking at the symbols almost as much as I loved playing the game. 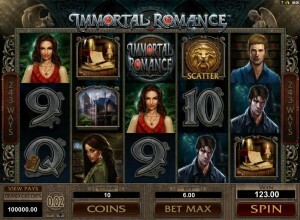 Symbols: Immortal Romance Logo (wild, 6,000x), Door Knocker (200x bet, scatter), Sarah (500x), Michael (450x), Troy (400x), Amber (350x), Castle (300x), Wine and candle (250x), Ace (150x), King (150x), Queen (125x), Jack (125x), 10 (100x) and 9 (100x). It’s worth playing for a couple of reasons, including the low wagering requirements, the great features, the quality of the design and even the theme choice. It’s not going to satisfy a high roller, as its prizes and wagers are very low, but those that just want to have some fun will enjoy it. You will find Immortal Romance at any online casino which chooses to use software from Microgaming, playable either for free or for real money.